Graeme Taylor serves up a classic Scottish stovies recipe, perfect for using up leftover roast meat, preferably for a Burns Night feast. The word stovies comes from the French étuves, to stew in its own juices and it is the perfect recipe for leftover roast meat. I always plan ahead and will cook a roast a day or two before Hogmanay just so that I can have stovies at the bells. Just about every home in Scotland will have a different recipe for this dish, depending on everything from where you live, to what meat you prefer for your roasts. 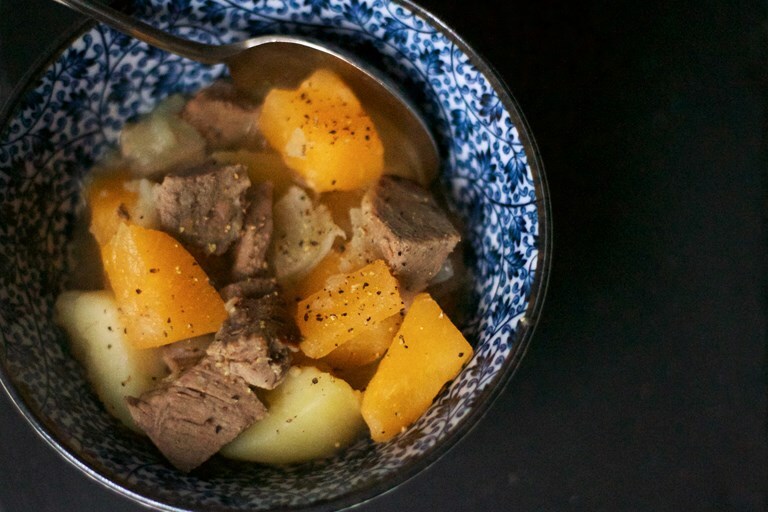 When I was young my mother would stew potatoes, carrots, onion and turnip in gravy and then add the leftover chopped lamb at the end to warm through. This is where I have returned after many iterations and variations through sliced potatoes hotpot-style to simply meat and onions. I do however prefer to use mutton for a deeper flavour. I leave the carrots in here for authenticity of childhood memory and out when I cook. I can’t abide cooked carrots. I prefer to use fresh stock but by all means use a cube if you don’t have any.